The Thermo Forma Series 3 Water Jacket CO2 incubator 4110 provides you with outstanding protection against temperature loss comes in case of unexpected power outage thanks to a durable triple wall construction. The temperature recovery and stability provided by this labortory incubator's construction is critical to labs working with cell cultures, and drops just 7.6° C temperature drop after 10 hours of power failure. The Thermo Forma Series 3 Water Jacket CO2 incubator minimizes the risk of air born contaminants with it’s patented in-chamber HEPA air filtration system. This CO2 incubator uses a HEPA flow air system to continuously filter the entire chamber volume every 60 seconds, minimizing particulates to ISO class 5 cleanroom levels while preserving your aseptic culture environment. The Thermo Forma Series 3 CO2 incubator 4110 is simple to operate and program with use of the iCAN interface. The screen is mounted on the door of this laboratory incubator, that gives users at a glance monitoring of the system parameters, displays visual alarms and logs all incubator interactions. The Thermo Scientific Series 3 Incubator comes with polished stainless steel interior and built for easy cleaning, while meeting the needs of any specific laboratory. Relative humidity in this laboratory incubator is achieved with a removeable humidity pan. Additional features include CFC-free foam insulated outer door, durable triple-wall cabinet construction, and magnetic outer door gasket. This lab incubator also features a heated inner glass door that allows for visual inspection of samples without disturbing the environment. 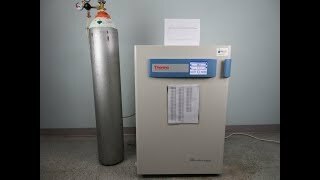 This Thermo Forma Series 3 Water Jacket CO2 Incubator is brand new out of the box. There is a small dent to the door, however it does not impact performance and is cosmetic. We have inspected it for functionality and it performed as expected. All of our lab equipment comes backed with our standard warranty. Should you have any questions, please don't hesitate to contact us.